The Big Bore Aluminium Shock Set includes 4 high performance coilover shocks with springs. It comes preassembled and fits all Savage trucks and includes 3 different piston sets, a variety of preload spacers, and complete instructions. 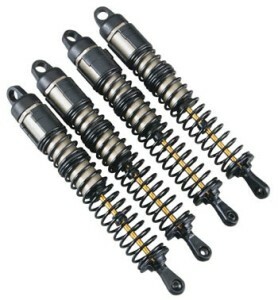 These shocks are preassembled but do not include oil. I enjoy their huge size and handling and they look good on my wraith.